Aim: To study the effect of lanosterol on age-related cataractous human lens nuclei. 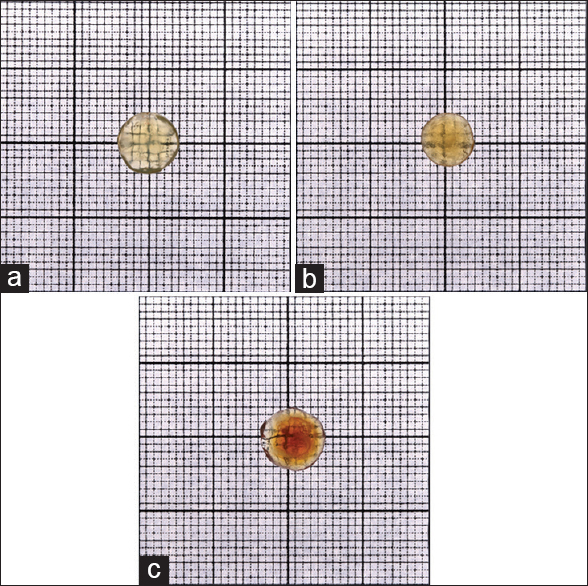 Materials and Methods: Forty age-related cataractous nuclei removed during manual small incision cataract surgery were obtained and randomly immersed in 25 mM lanosterol solution or in control solution and stored at room temperature for 6 days. Pre- and post-immersion photographs were graded by two masked observers and collated for the regression or progression of lens opacity. Results: Both lanosterol and control groups showed progression or no change in the lens opacity at the end of 6 days. Conclusion: Lanosterol 25 mM solution did not reverse opacification of human age-related cataractous nuclei. Zhao et al. 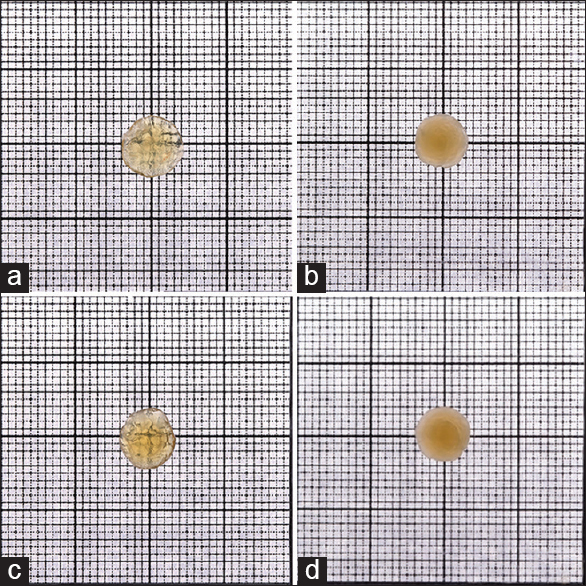 in a recent landmark publication demonstrated by in vitro and in vivo techniques that lanosterol reverses protein aggregation in cataracts of animals. The potential of this discovery is immense with half the world's blindness being attributed to cataract and cataract surgery is one of the most commonly performed surgical procedures. Cataracts contribute to more than 90% of the total disability-adjusted life years in developing countries and a nonsurgical treatment would greatly alleviate the disability without the burden of surgical costs. We herein evaluated if lanosterol could reverse protein aggregation in age-related cataractous nuclei of humans and report the same in this study. Forty cataractous nuclei of patients undergoing manual small incision cataract surgery for senile cataract were obtained for this study. Diabetic and posttraumatic cataracts were excluded from the study. The nuclei were immersed immediately in balanced salt solution and shaken to remove the adherent residual cortex. The nuclei were then placed over a grid, illuminated from below, and photographed. Parameters such as illumination, distance of the camera from the nucleus, magnification, and ISO were standardized for obtaining the images. Lanosterol 25 mM was prepared by adding double distilled H2O to a mixture of 12.5 g lanosterol (Tokyo Chemical Industry, Japan) 1.1 g (EDTA)2 Na, 0.55 g alkyl dimethyl benzyl ammonium chloride, and 200 ml EtOH to a final volume of 1.1 l. Control solution was prepared similarly but by excluding lanosterol. 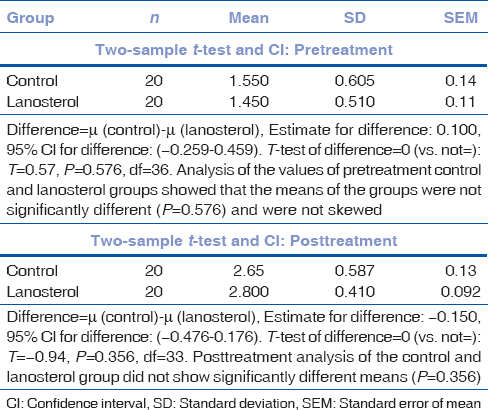 It was noted that lanosterol was only partially soluble in the above-mentioned solution; similar to experience of the original authors. By random selection, 20 nuclei were immersed in 25 mM of lanosterol solution, and the rest in the control solution without lanosterol and stored in dark for 6 days. The nuclei were photographed at the end of 6 days and the images were randomly presented to two masked observers who graded the nuclei using the photographic cataract grading system described by Zhao et al. [Figure 1]. As we used lenses obtained from patients scheduled for cataract surgery we were unable to include any Grade 0 lenses in this study. The pre- and post-immersion cataract grading for each nucleus was collated and compared. Statistical Software: Windows Office Excel ® version 2003 (Microsoft Office Excel 2003. Microsoft Corporation Redmond, Washington, USA) was used to tabulate the results. Minitab ® version 16 (Minitab Ltd. Brandon Court Unit E1-E2 Progress Way Coventry CV3 2TE United Kingdom) was used for the statistical analysis and generating graphs of the data. Both observers agreed that there was progression of cataract in 18 (90%) of the nuclei immersed in lanosterol and 14 (70%) of the nuclei immersed in control solution [Figure 2]. In 4(20%) control nuclei there was no change in the cataract after 6 days of incubation. There was discord amidst the observers in grading the opacity of 2 nuclei in each group [Table 1]. The pre- and post-test data were compiled for both groups [Table 2] and [Table 3]. Mean pretest nuclear grade was 1.55 ± 0.605 in the control group and 1.45 ± 0.5104 in the lanosterol group. After 6 days of incubation, the control group showed a mean nuclear grade of 2.65 ± 0.587 and the lanosterol group a mean nuclear grade of 2.8 ± 0.4104. 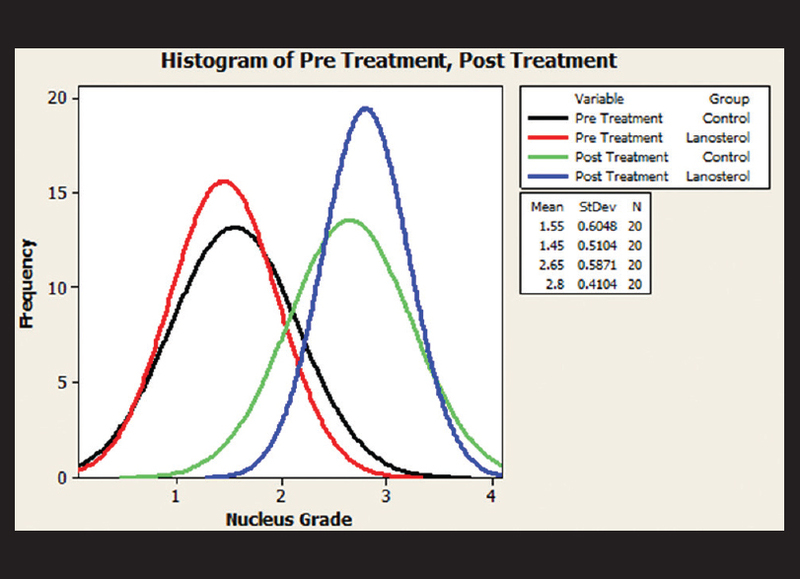 The "P" value of inter-group analysis did not show any statistical difference in mean value either before or after conclusion of the study (Pre P = 0.576, Post P = 0.356) [Table 3] and [Figure 3]. Zhao et al. have shown reversal of naturally occurring lenticular opacity by immersing rabbit lenses in lanosterol solution and incubating them for 6 days. We modeled our study on the same lines as Zhao et al., with the basic difference being that we used human senile nuclei obtained by the process of small incision manual cataract surgery instead of intact lenses, thereby lacking in the lens capsule, and cortex. However, we were unable to replicate the results of Zhao et al. in our study using human cataractous nuclei. Lenticular opacification progressed in 90% nuclei in the lanosterol group and in 70% of the control group. The grade of opacification after 6 days of incubation was also not significantly different between the two groups. One of the observers felt that one nucleus appeared less opaque, but this was not supported by the other observer and is too weak a link to rely upon [Figure 4]. It is unlikely that the deviation in our experimental technique of not using whole lenses but the nucleus be the reason we were unable to replicate the results of the study by Zhao et al. Zhao et al. have shown that lanosterol acts by reversing the protein aggregation within the lens fibers. As we used only nuclei, lanosterol would have better access to the lens fibers with no capsule or cortex to act as a barrier and hence should have resulted in clearer lenses in contrast to our finding of the progression of opacification. Given that we replicated the methods described by Zhao et al. with the exception of replacing animal lenses with human nuclei, one can only postulate that lanosterol in the given concentration described by Zhao et al. is inappropriate for reversing protein aggregation in the nuclei of human lenses. Human cataractous lens is likely to be tougher than rabbit and dog lenses and hence, the concentration of lanosterol used by us may have been inadequate to reverse the cataract in senile human lenses. However, we found no difference in the progression of cataract between the control and lanosterol-treated lenses. It is also possible that proteins other than lanosterol play a role in senile human lenses, given that the earlier study was done in a family with congenital cataract. The differences in the molecular pathways of congenital and senile cataracts have been elucidated by Hejtmancik et al., Multiple authors have shown that congenital cataracts are usually secondary to accumulation of altered protein residues due to missense mutations and ferritin levels in specific cases. They have also indicted age-related imbalance of chaperones and accumulation of degraded and denatured normal proteins in senile cataract. Further, basic science research will provide us more distinction between the two pathologies. It also remains to be seen if immersion of intact lenses with the capsule or altering lanosterol concentration or the solute may result in positive outcomes. 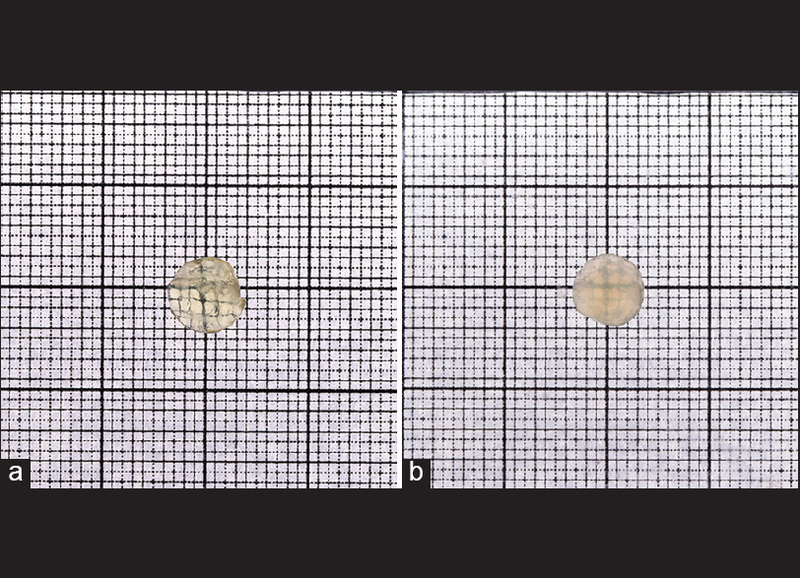 Twenty-five mM lanosterol solution failed to reverse nuclear opacity of human cataractous nuclei after 6 days of incubation. Zhao L, Chen XJ, Zhu J, Xi YB, Yang X, Hu LD, et al. Lanosterol reverses protein aggregation in cataracts. Nature 2015;523:607-11. Rao GN, Khanna R, Payal A. The global burden of cataract. Curr Opin Ophthalmol 2011;22:4-9. Moreau KL, King JA. Protein misfolding and aggregation in cataract disease and prospects for prevention. Trends Mol Med 2012;18:273-82. Mori M, Li G, Abe I, Nakayama J, Guo Z, Sawashita J, et al. Lanosterol synthase mutations cause cholesterol deficiency-associated cataracts in the Shumiya cataract rat. J Clin Invest 2006;116:395-404. Hejtmancik JF. Congenital cataracts and their molecular genetics. Semin Cell Dev Biol 2008;19:134-49. Hejtmancik JF, Kantorow M. Molecular genetics of age-related cataract. Exp Eye Res 2004;79:3-9. Beaumont C, Leneuve P, Devaux I, Scoazec JY, Berthier M, Loiseau MN, et al. Mutation in the iron responsive element of the L ferritin mRNA in a family with dominant hyperferritinaemia and cataract. Nat Genet 1995;11:444-6.